Hizb ut-Tahrir (HT), a radical Islamist group that is active in more than 45 countries, has one ultimate objective: to make Islam the global ruling system. 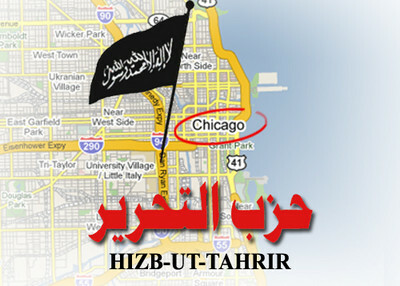 The U.S.-based branch, Hizb ut-Tahrir America (HTA), had hoped to spread that message last weekend during its second annual open conference outside Chicago. However, the group was forced to cancel after the Chicago Marriott Oak Brook backed out and HTA was unable to secure another venue. Despite this road block, HTA will persist because it will not want to appear defeated to its supporters or potential supporters; nor is it likely to back down from its ultimate mission. Furthermore, the conference was merely one aspect of the group’s activities in the U.S.
As a first step toward achieving its objective, HT intends to eject Westerners from all Muslims countries and establish a unified Islamic state ruled according to Shariah law. Once the Caliph (head of state) is installed and a military is established, it intends to “bring back the Islamic guidance for mankind and to lead the Ummah (Muslim community) into a struggle with Kufr (non Muslms), its systems and its thoughts, so that Islam encapsulates the world.” In other words, HT intends to incite a battle for control between Muslims and non-Muslims. HT knows its aspirations cannot be realized overnight, and it believes that the biggest obstacle in its way is the United States. In a 2009 leaflet, HT wrote, “O Muslims! You must realize that the United States is an enemy state that works round the clock to subvert the interests of the Islamic Ummah.” HT contends that Muslim leaders are subservient to the U.S., even while their people suffer from U.S. actions. HT has developed the conflict scenario further by opining that the U.S. has HT in its crosshairs, because HT is “the obstacle in the way of her evil plans” to “subjugate” all Muslims. It is unrealistic to expect that the world, much less the U.S., will be dominated by Islam within this lifetime. Among many reasons, the U.S. is a democratic republic, and Muslims account for less than 1% of the population. Despite that fact, HT has been developing its presence in the United States since the early 1990s. Although HTA has been busy recruiting and circulating its doctrine to American Muslims for more than 15 years, the group first came out publicly in July 2009 to announce its “Fall of Capitalism and the Rise of Islam” conference in Chicago. Until then, HTA used fronts and covers, but it has never attempted to conceal its aspirations. What are the activities that Muslims in the West should take part in as they work to re-establish the Khilafah? 1. Preserving the Islamic identity and strengthening the Islamic personality among themselves. This includes the awareness on all Islamic systems, values and concepts, and refuting non-Islamic ideas such as secularism, capitalism, democracy, regionalism, nationalism and so on. 2. Carrying the Message of Islam in its totality to the West not restricted to creed and rites. Rather, carry it as an alternative to the Western Way of Life. This includes presenting the Islamic position on all global matters. 3. Awareness on Western plans against Islam and Muslims, exposing them and annulling them if possible. Muslims in America, who witness the approval of such plans day by day, are best positioned to expose them. 4. Taking political stance that confront and knock down the regimes in the Muslim World. These regimes depend completely on Western support for their existence. Hence Muslims in the West can expose these regimes, deny them Western support, refute their arguments, and finally, de-moralize them. 5. Total adherence to the Divine Ruling and methodology in all situations. Other methodology where the ends justify the means, or where Islamic rulings are compromised, or material means are used, must not be followed. 6. Realizing the strategy of Islam: enhance the physical might of Muslims, weaken that of non-Muslims, strengthen morale for sacrifice among Muslims, and develop the zeal to change reality not to yield to it. These activities are direct pre-requisites to the work to establish the State of Khilafah. The goal, according to HT doctrine, is to change “the society’s existing thoughts to Islamic thoughts so that such thoughts become the public opinion among the people, who are then driven to implement and act upon them.” Thus, HTA intends for its counterculture beliefs to be adopted by the “mainstream” with the hope of creating a groundswell for change. This change would include a doctrinal shift in U.S. policy, which HT likely anticipates will ultimately soften the ground for the establishment of an Islamic state. In point 3, HTA calls for members to combat the United States from within by “exposing and annulling” government “plans against Islam.” The HTA leaflet does not specify what techniques should be used to accomplish this task. Thus, “exposing and annulling” could mean anything from circulating leaflets to infiltrating government, or far worse. Point 6 calls for supporters to enhance the “physical might of Muslims” and to “strengthen morale for sacrifice.” Although HT regularly insists that its method is non-violent, this document seems to indicate that HTA wants American Muslims to prepare for a physical confrontation with non-Muslims and the government. The U.S. provides a permissive operating environment for a group like HTA, which is anti-U.S. but has not issued overt calls for violence. HTA has not crossed the line by releasing statements that could be construed as “fighting words,” or words that would inspire violence against particular people. In addition to its work destabilizing the U.S. from within, HTA’s presence in the U.S. provides advantages to the global organization. Despite the poor economy, the U.S. may be one of the more prosperous sources of income for the organization globally. HT members in the West are expected to pay up to 10 percent of their income to the organization. Many members of HTA own businesses and hold prominent positions in their communities. It is unknown how many members of HTA there are, but likely their donations are generous compared to branches in other parts of the world. Most large university campuses in the U.S. have Muslim student organizations that are administered by the students themselves. HTA members have participated in, or have established direct control of Muslim student organizations. American students who have been exposed to HTA’s ideology may carry aspects with them through life. Foreign students attending universities in the U.S. may carry the ideology back to their countries. HTA takes advantage of young Americans’ appetite for popular culture by creating fronts, such as hip hop bands or online video companies. It also operates web sites that are designed to draw in unwitting visitors. Despite the setback caused by the cancellation of its Chicago conference, HTA will continue doing its work in the U.S. It will continue to find ways to spread its ideology, circulate its leaflets calling for violence against U.S. military present in Muslim countries, and will also continue to make provocative statements in order to spur confrontation between Muslims and non-Muslims. Challenging HTA at every turn will force the group to spend its time rethinking tactics rather than allowing it to move forward freely.